Cupcake cafés, ice cream parlours, cake shops…there’s plenty of choice in Bristol for those looking for a sweet treat. Milkshakes, though, are normally just a small part of the offering at venues around Bristol, with Rocotillos, Atomic Burger, Time Out Kitchen and The Beehive Coffee House among the favourite non-chain shake purveyors in the city. Now, though, there’s a new place on North Street dedicated solely to these decadent drinks, with Shake Express having opened on May 26th. 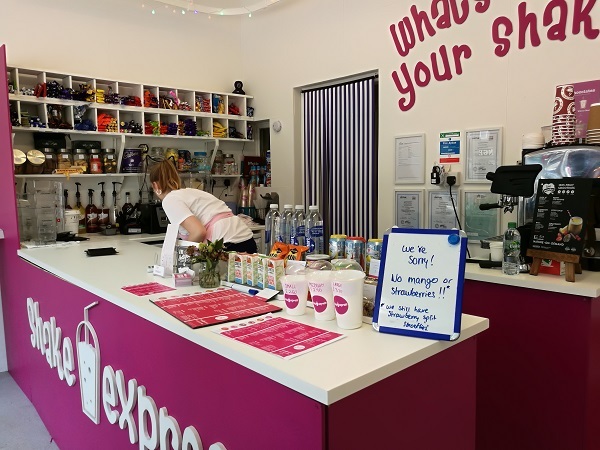 A mother and daughter-run business, Shake Express already has an established outlet in Braintree, Essex – and it’s now Bristol’s turn to experience the 120 flavours that they offer. There’s certainly no missing the bright pink exterior when you walk past, the large windows currently festooned with bunting and balloons which also catch the eye. It’s the same story inside, too: the counter sits behind a (slightly rickety-looking) pink branded frontage, the walls adorned with gaudy milkshake-themed artwork and slogans. In tiny writing on a huge blackboard to the right is the menu – and it’s vast. Chocolate bars, biscuits, sweets, syrups… there’s an enormous choice of ingredients to flavour your shake, and a selection of toppings too. Don’t fancy a shake? There are also various hot and cold drinks to choose from, as well as a small selection of crisps, muffins, flapjacks, cakes and ice lollies. Look to the left of the counter, and you’ll see shelves packed full of the ingredients used in the shakes – it’s a sweet-toothed person’s paradise! In the end, it was the Oreo that won out – mostly because I’m obsessed with the Oreo shakes at Byron, and I wanted to see how these compared. And it didn’t disappoint. Creamy, thick and with a good amount of Oreo flavour, it was just what I needed on a warm day. 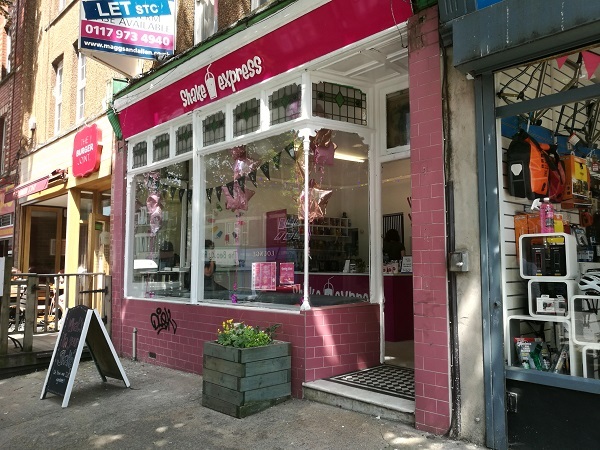 Nowhere near as rich and decadent as the Byron equivalent, mind – but the price is lower (I *think* the Byron ones were £4.25 when I last went, but I may be wrong…), and Shake Express is closer to home! There’s a loyalty card scheme for regular visitors too (buy 10, get one free), and a number of their shakes are vegetarian or vegan. I’m a huge milkshake fan and am well happy I don’t have to trek into town for a proper thick shake. 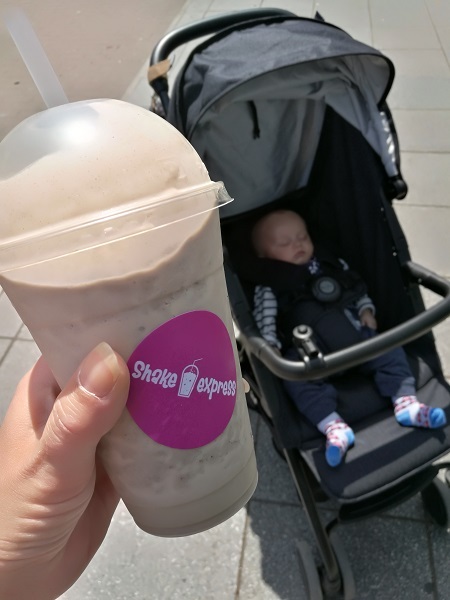 The shakes aren’t as refined as a Rocotillo’s or Shakeaway and the cheaper brand of ice-cream explains why some can look a bit yellowy, but they still taste great and you can’t deny the value – for the price of a medium Shakeaway, you get a large Shake Express. And here, you can also ask for skimmed milk, so you don’t fill yourself up too much if you fancy a shake a couple of hours before dinner!